My dear friends. I wish you a wonderful weekend!! Any exiting plans?? First of all I would like to thank you for visiting Urban Style Vibes* this week. Your sweet comments and e-mails are fantastic. I've read many blogs but unfortunately I was not able to comment on all your lovely posts but I must admit you really made my week!!! This weekend we will have our friends over for diner at our place and I will cook mussels. Usually I cook them Mariniere style: I add some vegetables, garlic and wine and let them cook twice, served with french fries but today I found this lovely recipe from Jamie Oliver. Click here to read the full recipe of the mussels meal showed above. Q. 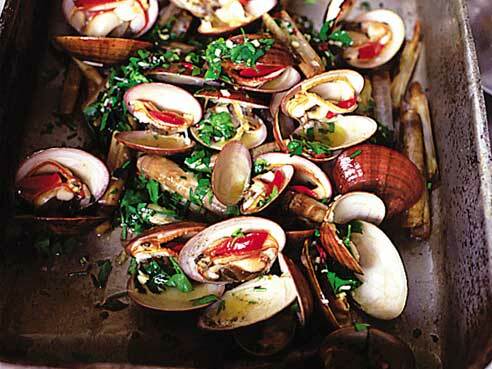 WHAT IS YOUR FAVOURITE MUSSELS RECIPE? PLEASE LET ME KNOW YOUR TIPS AND TRICKS I NEED SOME INSPIRATION!! Have a wonderful weekend and happy cooking! I love mussels, preferably cooked the way I've eaten them in Brittany, France and cooked them that way many times since then. You need onion, garlic, leek and carrots, all finely diced or chopped. Fry them delicately in olive oil, add some white wine afterwards and let reduce for about 3 minutes. Add the mussels and cook with lid on pot, give the pot a good shake after a minute and cook until the mussels have opened their shells. Add some crème fraîche and give it a good stir. Serve with french bread/baguette. You could replace the white wine with dry cider, that's delish, too. @ Maja, Thanks for this great recipe! I will try this tonight! I must say I am not a fan of mussels, but my husband is, so this will be bookmarked so I can make him a special treat one night. Thanks so much for sharing this!